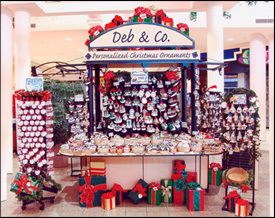 Deb & Co. began in 1979 with Debi Allison selling her handcrafted ornaments made of salt dough at local art and craft fairs in Florida. personalized ornament business into several Christmas kiosks covering the Southeast. They found that sales were not limited to Christmas alone, and established retail outlets in tourist locations such as Dollywood, located in The Great Smoky Mountains, Myrtle Beach, South Carolina, and Gatlinburg, Tennessee. Twenty years ago, Debi realized that she could achieve much more detail in her craft by switching her medium to polymer clay. Debi continued her locations at Myrtle Beach and Dollywood until she and her husband decided to move from Tennessee to Virginia. Debi has a fondness for nature and a love for animals. Her hobbies include, photography, rock and roll music and continuing to keep the economy strong by shopping (Shop ‘til you drop!). 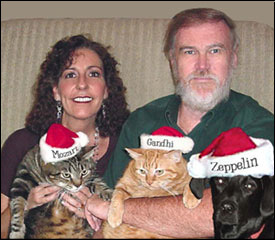 She collects antiques and shoes and plays nurse maid to her seven cats and epileptic dog. Deb & Co. maintain their retail kiosk operations throughout the Southeast, test-marketing new designs and listening to the customer. The company places such a high value on customer feedback that Debi and Glenn personally continue to work some of the top-rated, juried arts and craft shows in the nation. This policy insures a highly marketable and profitable product for their vendors. Debi and Glenn hope you and your customers continue to enjoy the Deb & Co. line as have the past three generations.